Helps promote healthy cardiovascular and immune system function. 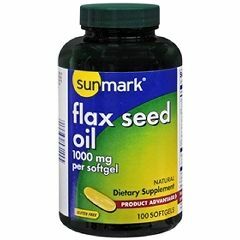 AllegroMedical.com presents The Sunmark Flaxseed Oil Supplement. 1000 mg. Helps promote healthy cardiovascular and immune system function. This statement has not been evaluated by the Food and Drug Administration. This product is not intended to diagnose, treat, cure or prevent any disease. Not made with natural rubber latex. Packaged: 100 Per Bottle.